Home » Blog » A Moving Picture: Whole Communities Walking the Path of the Lines? This article was posted on Friday, September 18th, 2015 at 12:45 am and is filed under Tours of Peru. The “Nazca Lines” captured people’s attention in the 1920’s, when commercial airlines first flew between Lima and Arequipa, in the southern part of Peru. The land, between the Andes on the one side and the ocean on the other, was barren for hundreds of miles. So how did those lines, many of which had clear shapes and recognizable forms, get there? Over the decades many theories, some more realistic than others, were tested about the purpose of the lines (also called geoglyphs). Some people were convinced they were archeological calendars or remnants of Inca roads. Others thought they were irrigation plans marking subterranean water routes. Still others theorized they were an ancient pilgrimage route, and, for some, the only thing that made sense was that they were a means of communicating with aliens. 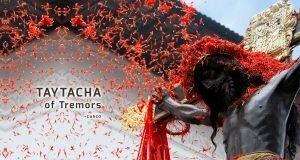 One recent theory that is gaining momentum is that, they were used in rituals, by entire communities. The lines are located in one of the driest places on earth, where water is often a scarce commodity. 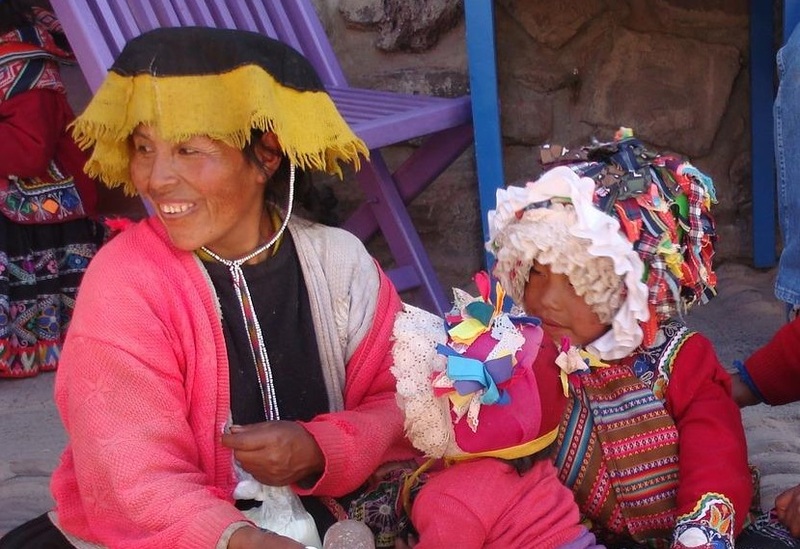 The Nazca people settled there, in a sheltered valley in the Andean foothills, somewhere around 200 B.C., and flourished for several centuries. Ten rivers come down from the Andes into the valley still today; evidence of Nazca settlements dot the terrain around these ribbons of green. The Nazca lines are not only lines. They are shapes, including sharks, orcas, lizards, dogs and monkeys, camelids, and bizarre humanoids, scenes of decapitation and trophy heads. They also include lots of geometric shapes, including trapezoids, triangles, and intersecting lines. First really researched only after world war two, recent studies have revealed new meanings for the lines. Researchers believe entire communities too part in the creation of the geoglyphs, which were made by removing the rock on the surface, to reveal the lighter, dry sand underneath. The spiritual capital of the early Nazca was Cahuachi, a site first excavated in the 1950’s. It was an almost 400-acre complex with an adobe pyramid, broad plazas, several large temples, and a network of corridors and staircases. The Nazca managed their limited resources for hundreds of years. For instance, they had a sophisticated system of water delivery and conservation, and they worked to protect the fragile substructure of the soil, planting seeds one at a time instead of plowing. There is also evidence that they recycled their garbage and used it as building material. As their population grew, however, the Nazca may have lost the rationale behind some of their methods. In the pursuit of supporting a growing populations, they cleared forests to plant crops. Unfortunately, the trees they cleared were the hurango, a tree with roots that can stretch as deep as 180 feet under the earth to reach subterranean water channels. These trees were vital for stabilizing the soil. Evidence shows severe flooding probably caused the Nazca downfall. 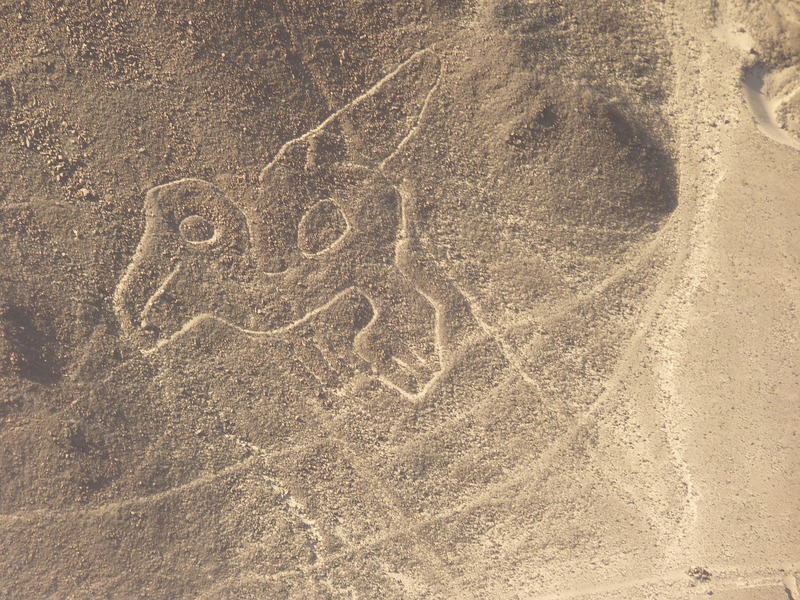 Although the Nazca weren’t he only civilizations that created geoglyphs, they are certainly the most well-known. While they flourished, they moved east and west along with the rainfall patterns. Researchers have explored the region from the Andean highlands to the Pacific coast, and have found evidence of Nazca villages, and nearby geoglyphs, almost everywhere they looked. Researchers are now coming together on a conclusion that the lines were used as pathways for ceremonial processions. One of the rationales for that conclusion are the single-line drawings (the spider and the hummingbird). The theory is that a person or people could walk each geoglyph without ever crossing another line. When a lot of peop0le walk over one area regularly, the soil is compacted. Some of the lines (such as the 2,000 foot trapezoid), have been tested and shown to be compacted. This further supports the theory that, though the rituals may have originally been single-person quests, they grew as the population grew, with more people participating. Whatever their purpose, the Nazca Lines are a marvel and a must-see for any trip to Peru. We invite you to join us on one of our excursions to see the Lines, as part of a customized visit. Bestperutours.com has received the Certificate of Excellence from Trip Advisor for the second year in a row. Book your tour to see Peru, and the Nazca Lines here.